By day the bright sun gleaming off the ocean and white architecture makes Mykonos glitter, but by evening it glitters with the coloured lights of fun. This is one of the best places to stay in the Cyclades if you love buzz, and our gurus are here to help you find the best places to stay in Mykonos. We have a great range of properties from the seriously luxurious to the more traditional. The Church of Paraportiani enjoys a wonderful setting just outside Chora. Be sure to bring along a camera and take some great snaps, especially at sunset! Wander along the narrow and cobbled Matoyianni Street, which is filled with wonderful boutique shops. A buzzy and bustling area with a real mishmash of stores. The Folklore Museum is a great spot to learn all about the island. Filled with an eclectic variety of artefacts bringing to life Mykonos's history and culture, it's a lovely place to visit. Spend an afternoon at Platis Gialos Beach. With a number of super restaurants and sunbeds on offer for €10 a day, it's a top place to take the whole family. Head off on a day trip to the nearby island of Delos, once the religious and political centre of the Cyclades. Legend has it that this was Apollo and Artemis's birthplace, but it was abandoned in the 19th century and now the only thing remaining is a series of ruins illustrating the island's rich history. Don't forget that this little Greek island is incredibly busy during the peak summer months. 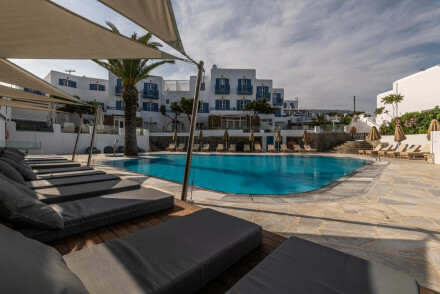 So if you want to guarantee a room in one of the best places to stay in Mykonos during July or August you'll need to be very organised and book well ahead. Not too long ago this island was a premier resort for gay travellers, so there's no shortage of camp-ish luxury in both clubs and accommodation. But the celebrity jet-setters who currently favour the island have design-chic-ed up some of the luxury. 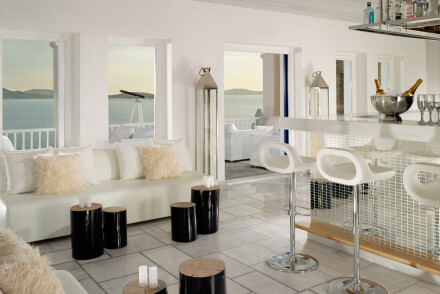 For money's-no-object lux, the Kivotos Club Hotel is the best place to stay on Mykonos. They send a limo to collect you, and their services include 'private yacht rental' as well as a cigar and caviar bar. 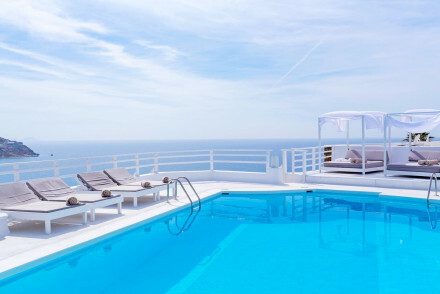 Mykonos Blu also offers serious luxury. Stay in a private villa with your own pool, and mini-garden; and cap off your evenings in their 'long hours' cocktail bar open pretty much all the time. 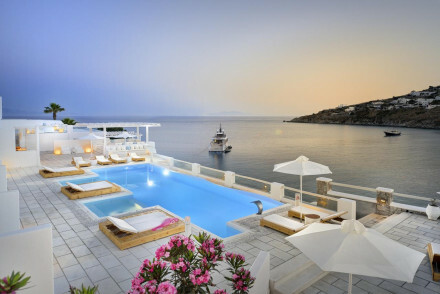 Also one of the best places to stay in Mykonos for honeymooners. 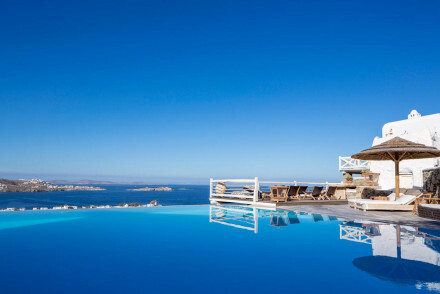 For traditional glamour, one of the best places to stay is Mykonos Theoxenia. It's 60s-tastic with its architecture and colour scheme - like being a James Bond glamour-puss! The upmarket Bill And Coo offers wonderfully chic whitewashed accommodation. Their minimalist and spacious suites come with lovely balconies offering sea views, whilst there's also a Mediterranean restaurant. Cavo Tagoo is a 5* stay right by the sea. This property's accommodation features four poster beds and balconies, as well as an infinity pool and extensive spa facilities. Grace Mykonos is an all-white glamour spot with glorious sea views. Providing a variety of suites with private balconies and some with hot tubs, there's also a lovely pool as well as a spa. What's more, their Grace restaurant is one of Mykonos' best! Santa Marina Resort & Villas boasts its own private beach area, two infinity pools, two restaurants and three bars! This 5* spot features elegant beach-chic accommodation, and you can also make use of their on site beauty salon and boutique stores. 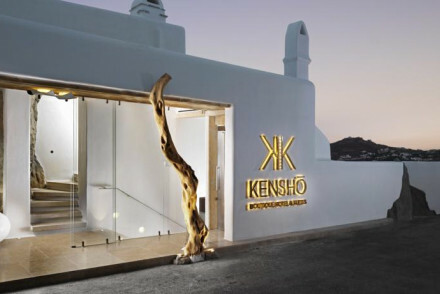 Kensho Boutique Hotel expertly combines luxury with traditional Cycalic design, offering elegant minimalist rooms (some of which even have their own pool!). Just a minute away from the beach, this is a wonderfully romantic stay. Beneath the glitz and busy throngs, Mykonos still has a lot of charm. Once one of the barest, poorest islands in the Cyclades, it has adapted to popularity without losing its traditions. Mykonos Town's layout and bougainvillea covered architecture make it easy to feel lost in a Greek island dream. And the famous windmills are more than just Kodak-fodder. 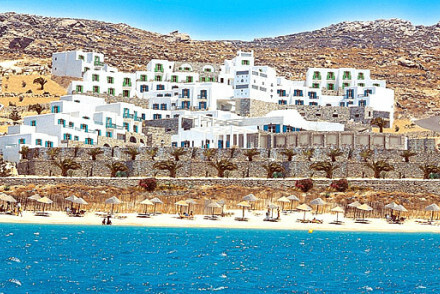 The Semeli Hotel is one of the best places to stay in Mykonos to feel the island's real pulse. This traditional mansion, and surrounding village of villas, stands stylishly aloof, but is close enough to enjoy local tavernas and explore the old town. Another of our recommendations if you want peace as well as parties, the Hotel Elena is a simple but charming pension in the heart of the village. 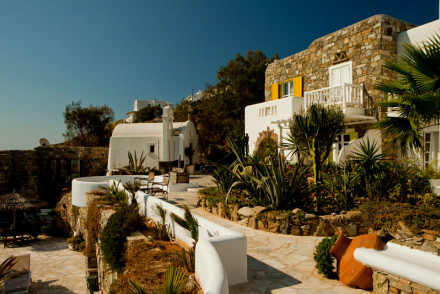 Tharroe of Mykonos is a boutique hilltop property overlooking Mykonos Town. Their rooms are chic yet understated and you can enjoy a range of treatments at the Calypso Spa. A top spot. The minimalist Ostraco Suites (located in the hills away from the buzz) has everything you might need for a holiday in the sun - whitewashed rooms with all the mod cons, private balconies, a lovely pool and a restaurant serving up organic Greek grub. 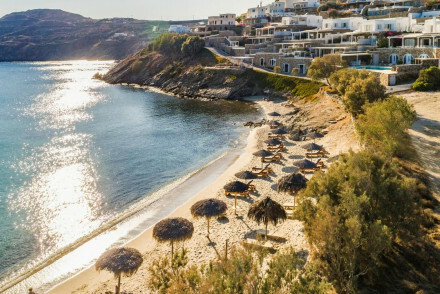 If you want to relax and recharge in the sun by day so you can eat, drink and dance all night then these beach-side beauties are some of the best places to stay in Mykonos. Did we mention Mykonos Blu's private beach is one of the best on Mykonos? With a spa, sauna, two level infinity pool and private hot tubs to boot, this is a wonderfully relaxing spot. Archipelagos features traditionally Mykonian style with plenty of blues and whites, whilst you'll love its location right by the Kalo Livadi Beach. With a spa and Greek restaurant as well, this is a lovely spot. 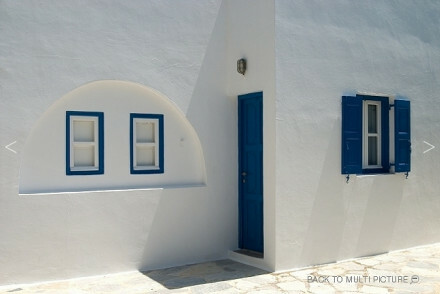 The eco-friendly Rocabella Mykonos offers chic whitewashed rooms with spectacular views of Chora. Unwind by the spa or pool before enjoying Cycladic food at the restaurant. Plus, Agios Stefanos beach is just around the corner! Myconian Imperial Resort is located right on the beach, providing contemporary chic accommodation with splendid views of the Aegean. This luxurious spot boasts three swimming pools, two bars and gourmet cuisine - what more could you ask for? De.Light Boutique Hotel ticks all the right boxes, just 5 minutes from the beach and offering simple yet stylish rooms. Soak up the sun whilst enjoying a cocktail from the pool bar and forget about all your worries! 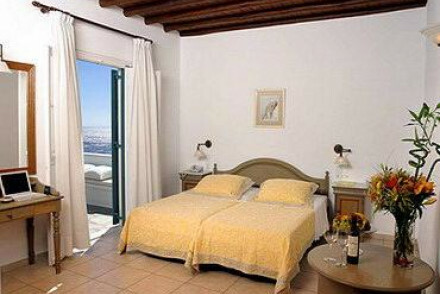 San Giorgio is a chic rustic retreat, offering whitewashed accommodation and a lovely pool area. What's more, guests get VIP membership passes to the Paradise Club including a shuttle service to take you there and back. Perfect for combining sun with fun. Perhaps you've decided that your needs are better served with a self-catering option. In that case, we recommend you check out the wide range with our online partner, Booking.com. Fy to Mykonos Airport, located in Chora, about 4 km southeast of Mykonos Town. Most hotels offer transfer services, however if this isn't the case, there are plenty of taxis outside the terminal to take you to the centre of town for about €8. Alternatively, during high season you can take a rather infrequent bus which runs to Fabrika station at a cost of €1.60. With most people coming to Mykonos for the nightlife and the good weather, it's probably best to visit from June to September (with the average daily temperature above 23°C). Be warned though that this is peak season, so expect to pay more for accommodation. The shoulder seasons (April, May and October) offer the best combination of decent weather and cheaper accommodation. That said, there's not nearly as much on as during the summer months. 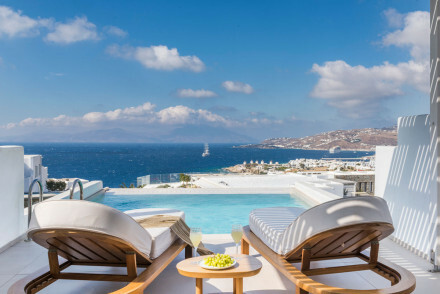 Browse through our list of all the best places to stay in Mykonos. Expand your search to include all our properties in the Cyclades. Or, feel free to contact one of our gurus for advice. 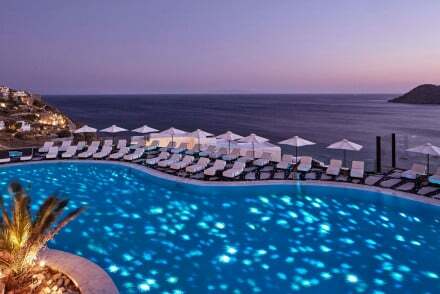 The 3* Aeolos Hotel is located in Mýkonos City, just a short distance from the sea. Offering unfussy accommodation featuring white interiors and boasting either garden or sea views. Lounge by the pool and soak up the sun or head off exploring the island. A great budget coastal spot. A white, bright and relaxed oasis of calm. Chic luxurious rooms with contemporary bathrooms, some suites boast private hot tubs. Enjoy stunning views, an indulgent spa and a fine dining restaurant. Proximity to Mykonos Town makes this ideal for those wanting to mix relaxation with some nightlife. Hideaway - A spa, pool and the sea make for a great hideaway with plush rooms, lovely terraces with seaviews and excellent service. Medium-sized, full-service hotel with bright, simply furnished rooms. 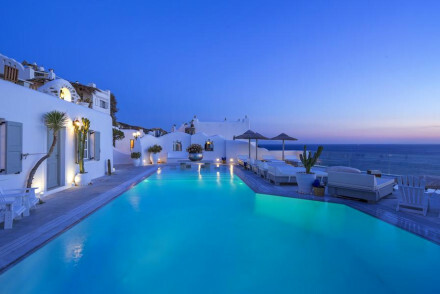 Best value on overpriced Mykonos - large pool, plenty of bars and eateries, and off street parking. Unbeatable views and family run, an unassuming gem. Sights nearby - Rent a car at the hotel and explore further a field. 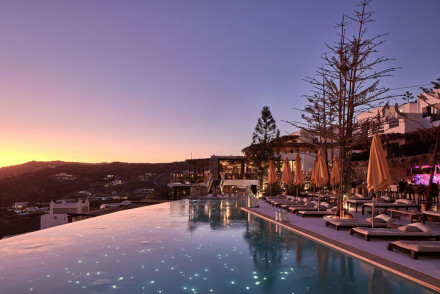 Boutique hotel located atop a small hill overlooking Mykonos Town. Offers a range of rooms and suites decorated in a contemporary manner. 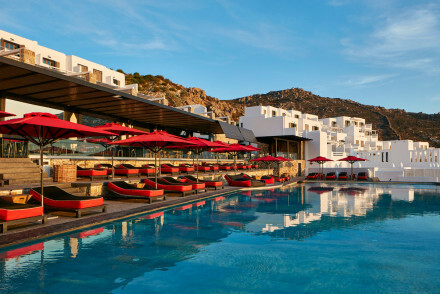 Go for a dip in the pool and enjoy the stunning views of the Aegean or have a drink on the terrace watching the sunset. Great location and friendly staff. Romantic Break - Long walks on the beach, relaxing in the spa and evening candelit dinners together-what could be better? Simple, friendly small pension with sunny rooms. Charming, with some four posters, and well positioned in the heart of the village. Good value and simple Greek living as it should be. A charming property traditionally built in a Mykonian style with amazing sea views. Chic rooms featuring lovely hues of blues and whites. An outdoor pool, a spa and a restaurant serving authentic Greek cuisine on site. A very warm and inviting hotel. Great for couples or individuals. Total relaxation - The perfect spot for unwinding, either by the pool, or in the wellness centre, with spa, sauna and hot tub. Local exploring - In a great location overlooking the Aegean Sea and close by to the beautiful traditional villages as well. Beach Life - The Kalo Livadi Beach is ideal for beach lovers with its sandy shores and crystal clear waters. Local markets - Stroll around Chora (Mykonos Town) and check out the churches, monuments and shops. A chic minimal retreat in the hills. Lovely rooms and suites have all the mod cons, private balconies and sea views. Gorgeous pool and lounge area. Walking distance to restaurants and close to the beaches. Ideal for all sorts of sun seekers and wedding groups - there are two churches. Weddings - 2 nearby churches. Osom resort is a quiet hotel offering just a collection of rooms and suites. Bedrooms are spacious, contemporary, and come with terraces and sea-views. The large outdoor pool is its crown jewel, which comes with panoramic sea views and poolside cuisine. Beach and restaurants are a short walk away. Beach Life - Beach Korfos - a windsurfing spot - is just a five minute walk away, plus available transfers to Mykonos' famous beaches! 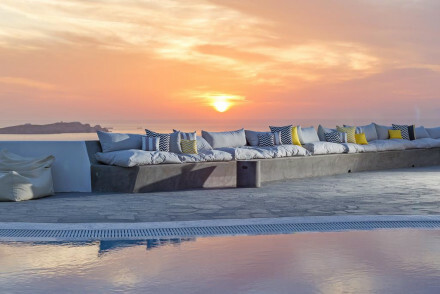 Absolut Mykonos enjoys a hillside location in Mykonos city, boasting splendid ocean views. It offers a range of luxurious suites featuring plenty of light hues in the typically Cycladean style and complimentary Molton Brown bathroom goodies. Stunning Greek cuisine too! A top romantic retreat. Fusing luxury with traditional Cycladic designs, this stunning boutique hotel gets the decor spot on. Sophisticated and authentic, many of the rooms include private plunge pools. They are real havens of relaxation. With its stunning coastal location, the hotel encapsulates the romance of Mykonos. Beach Life - One minute's walk from the beach - you couldn't get much closer! Local markets - Visit Matogianni Street, home to a fine selection of designer boutiques, bars and art galleries. Great walks - Take walks along the stunning Mykonos coastline. This pretty hotel offers self-contained studios and private villas overlooking the beaches of Korfu and Ornos. The largest villas can host up to 4 people, boast two terraces and a separate living and dining space. Expect a neutral palette for soft furnishings and Cycladic touches. A charming hotel. 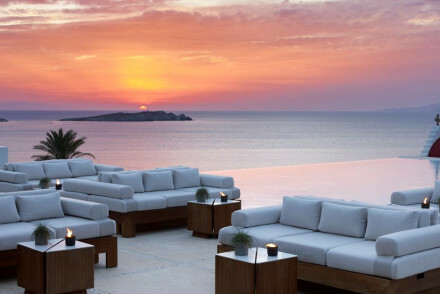 This five-star luxury hotel overlooks Psarou Beach in Mykonos. Choose between elegant rooms and spacious suites dressed in crisp white linens with indoor jacuzzis; the self-contained villas are great for families. Relax by the hotel pool or at the gourmet seafront restaurant. A refined beach hotel. Pietra e Mare is tucked away on an idyllic hillside on Mykonos' quieter side. As an adult-only hotel, rooms and suites are perfect for holidaying couples. The minimalist design mimics the island's blue and white Cyclidic architecture. Queen size loungers overlooking the Aegean call for relaxation. A chic eco-hotel located close to the beach with spectacular views of the ocean. Rooms are creatively adorned in whites and browns using local materials. A pool and a spa for your enjoyment and a Greek restaurant serving fresh food. The stylish pool side bar is perfect for a romantic sundowner. Eco break - Solar panels at the hotel to heat water and bicycles are provided for free to encourage sustainable living. Families - The two bedroom suite is big enough to sleep four people, cribs and cots can be provided on prior request. Romantic Break - The great views, elegant rooms, chic poolside bar and knockout food make this the ideal couples retreat. Beach Life - Agios Stefanos beach is located a short stroll from the hotel. 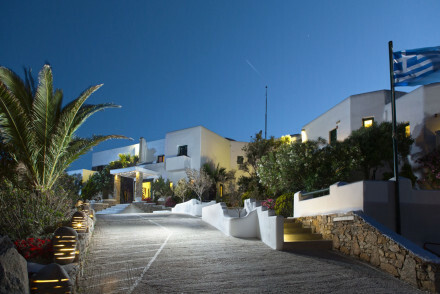 De.Light Boutique Hotel enjoys a superb location in Mykonos overlooking the Aegean sea. Spacious, simplistic accommodation decorated in a typically Mediterranean fashion. Relax with a cocktail from the pool bar and enjoy the splendid views! An utterly rejuvenating coastal spot. Diving - If you fancy going on an unforgettable adventure then head off deep sea diving! A super cool hotel right on the beach, with amazing views of the Aegean Sea. Contemporary, chic rooms with five star amenities, some with outdoor hot tubs and private pools. Three swimming pools, gourmet cuisine, two bars and a spa on site. A luxurious affair. Honeymoons - Ideal for honeymooners, beautiful rooms with private balconies and spectacular views, spa services and gourmet cuisine. Families - The Executive and Junior Suites can accommodate upto 3-4 persons, perfect for families. Beach Life - The hotel has its own private beach area exclusively for hotel guests. Local markets - Check out the jewellery, clothing, arts and crafts souvenir shops that litter this area. This five-star hotel is a member of Relais & Châteaux and has an emphasis on wellbeing. Rooms are luxurious and contemporary, featuring a whitewashed design and plush beds. Private pools and jacuzzis look over panoramic views of the Aegean, while the trendy pool deck makes for a cool vibe. Chic boho island retreat. Gorgeous, almost rustic rooms and suites, in minimalist design. Lovely pool and sun bathing area. Excellent Mediterranean restaurant serves organic/local food. A cool choice for sun seekers and romantics. 1960s glamour with a 21st-century twist. Funky interior design, with bright colours, shag carpets and boutique detailing. Startling views of the famed windmills. Gastronomic delights whipped up in the oh-so trendy restaurant. Close to the nightlife in Mykonos Town. A chic option. Romantic Break - The ideal spot for a romantic getaway- chic suites with magnificent views, treatments at the spa and nights out on the town. 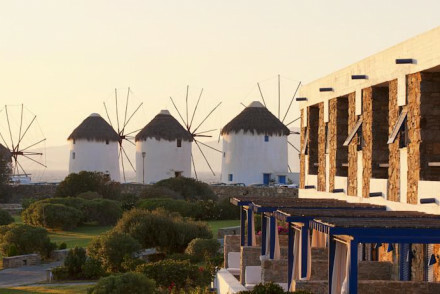 Sights nearby - Walking distance from the famed Mykonos windmills. A stunning hotel with fabulous sea views. Traditional white washed rooms with simple contemporary art and modern bathrooms. A glorious infinity pool and restaurant serving modern Mediterranean cuisine - with a delicious breakfast included in the rate. Easy access to the town centre and beaches. Hideaway - A small hotel perched atop a hill with wonderful seaviews. Complete tranquility. Sights nearby - Explore any one of the 400 tiny Byzantine chapels. 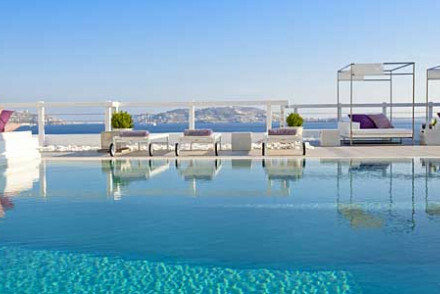 This hotel offers luxury, self-contained accommodation in Mykonos. 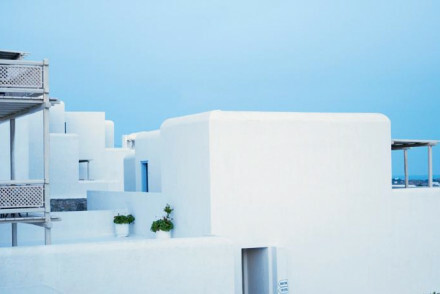 Drawing on elements of Cycladic architecture, expect whitewashed rooms and simple, elegant interior design. The larger maisonette offers separate living and dining space; guests have shared use of the pool. A smart seaside stay. Wonderfully chic all white minimalism with spectacular views over the ocean. Spacious suites with all the mod cons and gorgeous balconies. Lovely pool lounge area and Mediterranean restaurant. Perfect for swish honeymooners. 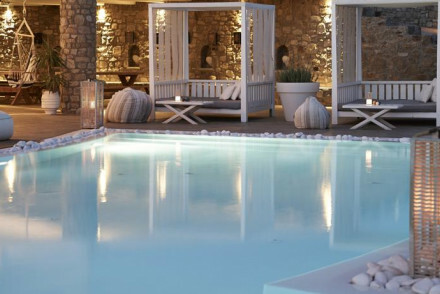 A charming beach-chic five star boutique on the sandy shores of Ornos Beach, Mykonos. The elegant rooms offer white on white interiors with splashes of blue and grey, some have private balconies with hot tubs and sea views. The restaurants are excellent and the spa is a local favourite. Five Star paradise facing the sea. A collection of rooms, suites and villas, all utterly romantic with four poster beds, private balconies, private pools, and wonderful views. Glorious infinity pool surrounded by a restaurant. Extensive spa. Very luxurious. Suites - 33 of the suites have private pools. Utopia is a gorgeous hotel offering luxurious rooms, spectacular sea-views, and great service. The design is contemporary and furniture is carved from local wood and stone. The infinity pool and bar make for a cool atmosphere. Some rooms come with private jacuzzis, while villas are even more lavish. Spa breaks - Take a dip in the spa's thalassotherapy pool or take a private massage in a Myconian ocean cove! 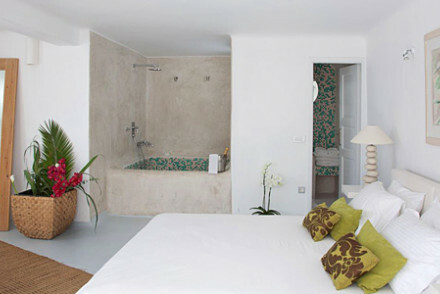 Located above Elia Beach, this hotel offers rooms, suites and villas all with either private pools or jacuzzis. Decor is stylish, featuring white walls, Persian rugs and hanging lights. Round-the-clock service is 5-star, while the gourmet restaurant, spa and beach create an exceptional experience. Village style resort offering serious luxury, with private villas, pools and stunning views. White on white interiors off played by touches of cool blue. Boasting an excellent spa and a number of bars and restaurants. A wondrously romantic spot overlooking Mykonos's best beach. Total relaxation - Exclusive resort offering spa, sauna, private hot tubs, two-level infinity pool and gourmet dining with a view. Beach Life - Set on its private part of the lovely Psarou beach, with access to loungers and yacht rental. Diving - There are a number of dive centres on the island, make the most of the crystal clear waters. 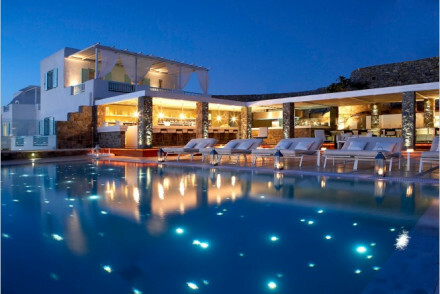 This luxury hotel sits on the relaxed south coast of Mykonos, above Platis Gialos beach. Suites are spacious and bright with hand-selected design pieces; for added indulgence, book a room with a private hot tub. Enjoy a treatment at the sleek spa before dinner at restaurant Efisia. A VIP treat. A refined luxury hotel and spa sitting on the rocky Aegean cliffs overlooking the ocean. Minimalist suites offer clean cut lines, indulgent furnishings, private balconies and the odd subtle nod to the hotel's nautical theme. Top notch services from the spa, to the food and cliff side infinity pool. 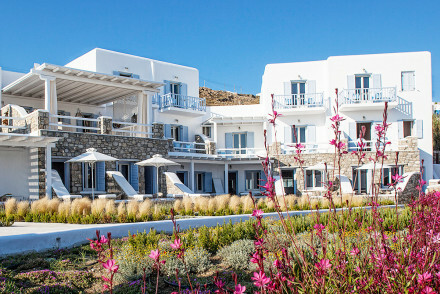 This newly renovated, luxurious resort stands on its own breathtaking peninsular on the trendy island of Mykonos. 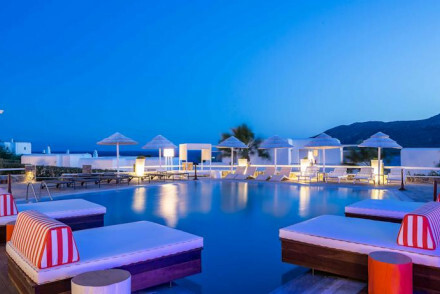 Panoramic sea-views surround the hotel and infinity pool, whilst VIP dining is accompanied by famous DJ sets. Rooms, suites and villas are contemporary, stylish and spacious. Get jet set, go! An all white glamour hot spot in utmost luxury. Various sizes of suites have private balconies, some with private hot tubs, and gorgeous sea views. Lovely pool, extensive spa and plenty to do on the island. Ideal for honeymooners, romantics, and sun seekers. 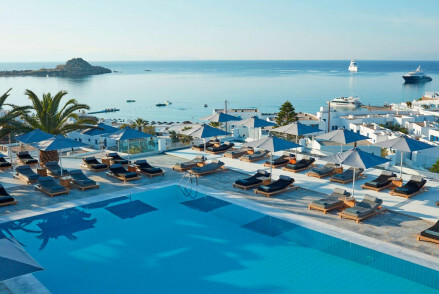 A luxurious beach resort with contemporary, Cycladic architecture of blue and white decor. Rooms and suites are spacious, some with private terraces and infinity pools. The hotel's seafront spa, private sandy beach and poolside bar guarantee a sophisticated and relaxing hotel. Total relaxation - Relax by the pool, take in the breathtaking seaviews, indulge in a poolside cocktail or enjoy a relaxing massage! Weddings - The hotel offers an idyllic wedding held in its own traditional chapel located just 30 metres from the beach! 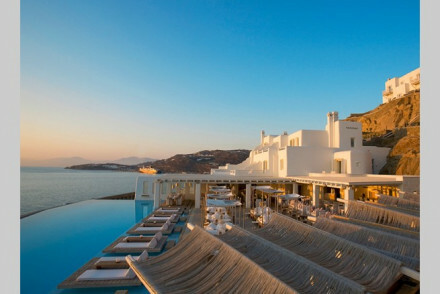 This three-star hotel is located in the pretty town of Chora, Mykonos. Rooms are dressed in nautical blues and greens with wood accents; suites offer a private sauna while superior rooms boast a terrace hot tub. Cool down in the seawater pool before dining on the beach at this chic seaside hotel. A chic boutique on the outskirts of Mykonos town. 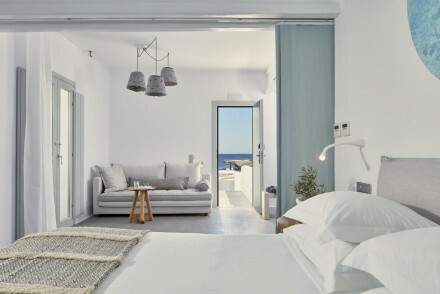 The fabulous suites boast cool contemporary furnishings in a truly Greek white on white minimalist style, with private balconies and knockout views. 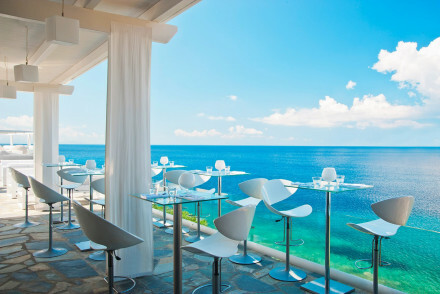 The restaurant serves modern Greek cuisine overlooking the Aegean, and the cocktails are to die for. An uber luxe retreat with its very own private beach and 5 star services. 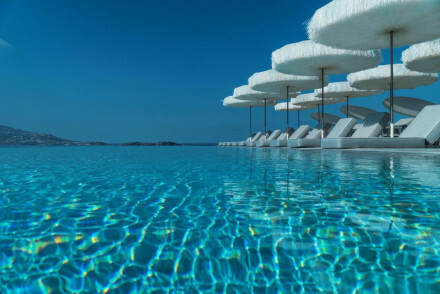 There are two infinity pools, choice of two restaurants and three bars, a full service spa, a beauty salon, designer boutique stores and private villas. Rooms are opulently furnished. A grand and luxurious stay. Total relaxation - The on site spa offers massages and a beauty salon to pamper and indulge, as well as five star service and a serene setting. Romantic Break - A super romantic destination with a private beach front, fantastic food, beach chic suites and luxorious touches. Sights nearby - Guests must visit the windmills located close by to the hotel. 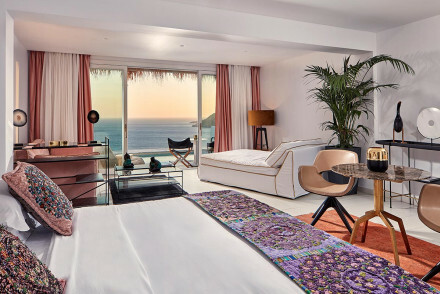 Avaton is a design hotel, boasting stylish rooms decorated with local stone, animal skin rugs and large artworks. 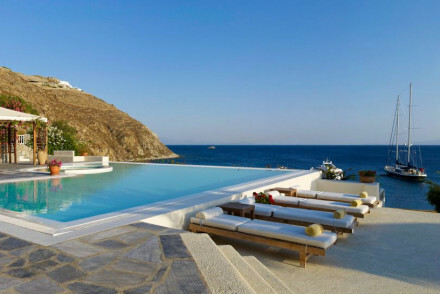 Suites and villas come with private infinity pools overlooking the Aegean Sea and are favoured by visiting celebrities. Spa, pool and private beach promise a stylish and relaxed stay. Groups - The large Apocalypsis Villa can sleep up to 10 people. Comes with cutting edge design, a vast terrace, and a private pool! The private yacht, limo transfers and a caviar bar set the tone for this super luxurious hideaway, with it's own private beach. Traditional hillside building with uber contemporary interiors. Two fabulous restaurants and a chic bar. Top honeymoon and romantic break destination. Honeymoons - A dream like location- seriously romantic suites with welcome champagne on arrival, and fine dining overlooking the bay. Sailing - A privately owned stunning 25-meter schooner for day trips to the surrounding islands. Sights nearby - Visit the nearby Mykanos white washed windmills, a well known landmark on the island. Luxury boutique hotel on the cliffs with stunning azure views. The last word in Aegean-chic with a hip pool-terrace and bar. Slick rooms have a minimalist design featuring crisp whites, splashes of colour or artwork and natural materials. The indulgent spa and stellar organic cuisine seals the deal! This adult-only hotel offers a luxurious poolside stay for couples. The 18 suites are large, with four-poster beds and private infinity pools. Panoramic sea views surround the hotel. A large outdoor pool with loungers, fresh cuisine and expert cocktails allows for luxurious all-day lounging. Honeymoons - This is the ultimate place for your honeymoon. Luxurious suites, infinity pools, gourmet cuisine and beach, sea and sun! 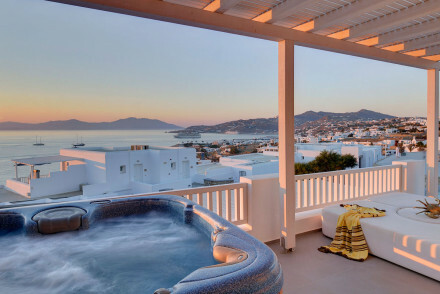 This luxury resort boasts views over the longest sandy beach in Mykonos. The spacious suites have whitewashed walls and driftwood details; the best offer ample living space and a private infinity pool. Enjoy à la carte dining at the restaurant or order in to your room. An indulgent seaside hotel. This is a five-star hotel located on one of Europe's most glamorous islands. Perfect for luxury-seekers, this superbly designed hotel exudes sophistication. Its grand spa, private suites, and round-the-clock service take Bill & Coo to the next level - not to mention its award-winning restaurant. 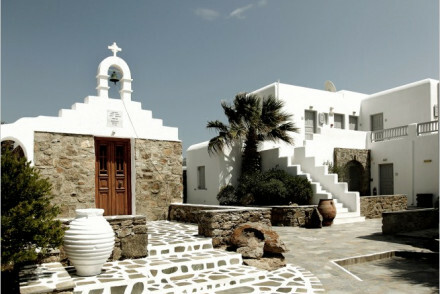 This four-star boutique hotel is located close to the centre of Mykonos. Rooms are modern and dressed in a soft palette; wood and wicker accents add a homely feel. Choose a cottage suite for a four-poster bed and idyllic terrace. Unwind by the infinity pool overlooking the sea at this pretty hotel. Kenshō Psarou is five-star Aegean luxury. 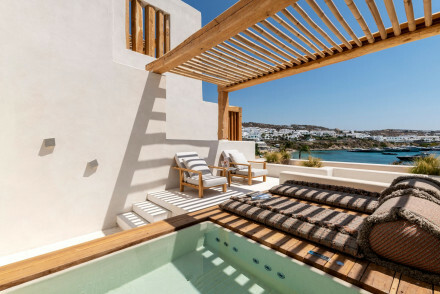 A coveted beachfront hotel and spa on the paradise Greek island Mykonos, all rooms have either a hot tub or plunge pool, cool stone floors and stunning sea views. Indulge in a massage at the spa before dining in the lounge at the water's edge. A real treat. 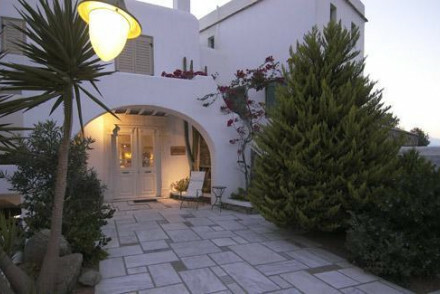 This boutique hotel is located just outside Mykonos city centre within tranquil gardens. Rooms blend contemporary interior design with natural elements; most offer a private terrace and some have sea views. Relax by the hotel pool before dining at the restaurant. A stylish Mediterranean bolt-hole. These beachside luxury villas in Mykonos have full self-catering facilities; the best also offer a private pool, personal chef and housekeeping services. Choose the Magnificent Villa Sunset to benefit from access to the hotel spa. Enjoy fine dining at the terrace seafront restaurant; a stylish stay.